From sourcing to the selection process, hiring, onboarding and personnel management ─ Microsoft Dynamics 365 for Talent covers the entire HR process in one centralized solution. Use it with Office 365 and LinkedIn or integrate it into your existing management systems and benefit from streamlined processes, reduced administrative effort and lower costs. Quickly hire good fits for your company. Plan and manage all necessary steps centrally in the app ─ from first contact to interview and hiring decision all the way to the actual hire. High-quality onboarding accelerates the settling-in process. Reduce adminstrative effort through streamlining organiza-tional aspects. Track success with performance reviews and feedback. Keep a record of trainings and certifications and make recommendations for continuous learning. Clearly defined role-based skills and competences promote professional advancement for each employee. Both your HR department and your business as a whole compete with other companies for top talent. To come out on top and attract the best qualified candidates, smart processes and a high-performance solution have to be in place. With Dynamics 365 for Talent, you can optimize your HR processes from A to Z. Not only will you attract suitable candidates but you can also integrate new hires better and increase the probability of a longterm commitment to your organization. Automating routine tasks, such as compensation, frees up your HR team to focus on strategic initiatives. 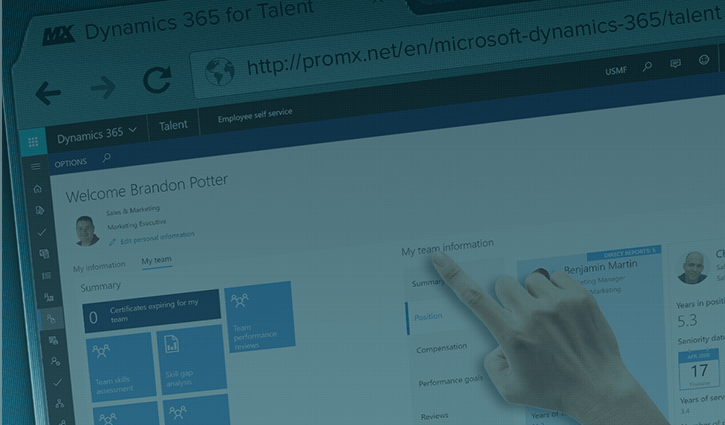 proMX has been focusing on Dynamics 365 for Talent since its release. Our team has been trained extensively and can show additional experience with HR software and from processes from our own solutions. The feedback we have received from the first Dynamics 365 for Talent projects with new and existing customers has been very positive across the board. 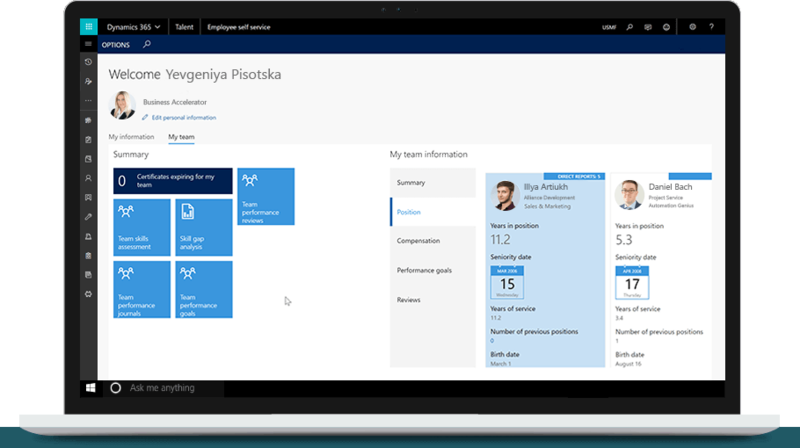 Judging from our experience with Dynamics 365 for Talent thus far, the potential of the app is enormous! Elevate your HR department to a new level with Dynamics 365 for Talent. Make an appointment for a webinar to experience the solution with your own eyes. 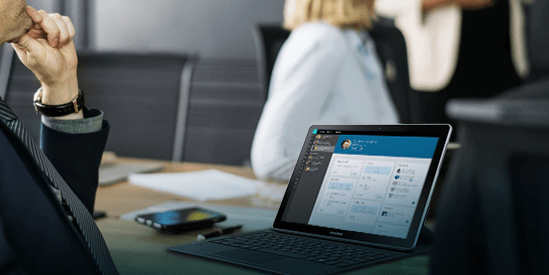 A suite of popular productivity and collaboration tools, such as Outlook, Word and OneDrive, indispensable for the modern workplace. It simplifies and accelerates collaboration and information sharing across devices, thus increasing productivity. A suite of intelligent cloud business applications. Dynamics 365 is made up of over half a dozen apps that combine CRM and ERP functionality with each focusing on a different aspect of your business, including sales, customer service and human resources. An inexpensive and secure alternative to costly additional Dynamics 365 SQL server storage space. proStorageSaver automati-cally moves files like e-mail attach-ments and notes to Azure Blob cloud storage. A complete business solution that includes Office 365, Windows 10 and Enterprise Mobility + Security. 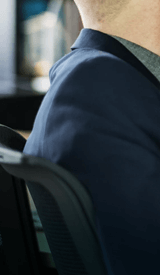 Microsoft 365 gives you the tools to be productive and collaborate efficiently while your data is protected from unauthorized access and cybercrime.